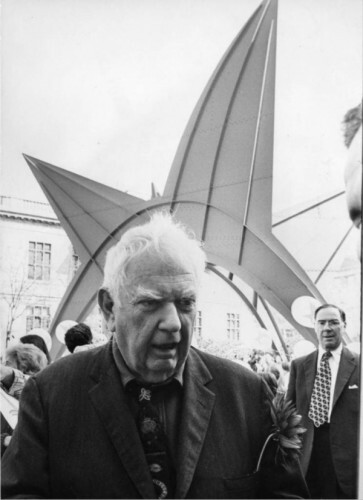 On October 10, 1973, Alexander Calder’s sculpture, Stegosaurus, was dedicated in Hartford. Constructed of 45 thin steel plates bolted together in an abstract form representing a dinosaur from the Jurassic Period, the 50-foot-tall, red-orange stabile is located on the Alfred E. Burr Memorial Mall, between the Wadsworth Atheneum Museum of Art and City Hall. Commissioned by the trustees of the Ella Burr McManus Trust Fund, the sculpture is a memorial to McManus’s father, Alfred E. Burr, founder of the Hartford Times.